In large bowl, beat sugars, peanut butter, shortening, butter and egg with electric mixer on medium speed, or mix with spoon. Stir in flour, baking soda, baking powder and salt. Cover; refrigerate about 3 hours or until firm. Heat oven to 375ºF. Shape dough into 1 1/4-inch balls. On ungreased baking sheet, place balls about 3 inches apart. Flatten slightly in crisscross pattern with fork dipped in flour. Bake 9 to 10 minutes or until light brown. Cool 2 minutes; remove from baking sheet to cooling rack. Cool completely, about 30 minutes. 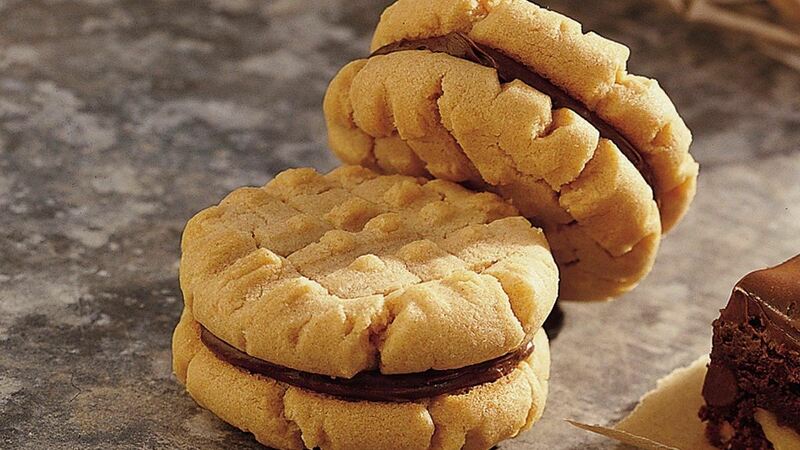 Spread chocolate frosting between bottoms of pairs of cookies. Special Touch: Pack a stack of cookies in a see-through bag, and tie with ribbon for gifting or selling at bake sales.